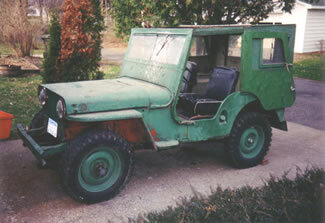 1947 CJ2A found a chicken coop! Mike Wetteland sent in his story about his 1947 2A. 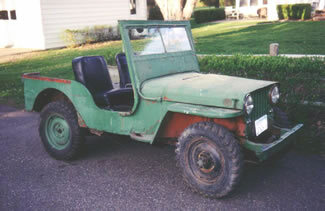 I purchased my CJ2A from an older gentleman in Northfield MN in 1998. It was stored in a chicken coop, and was a favorite perch for the resident rooster. 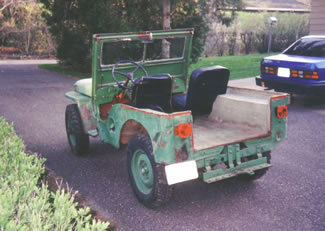 It had a homemade hard top, fabricated from plywood and angle iron. I proceeded to cut as much of that off as possible, and then gave it a good scrub. The serial #’s on the firewall and frame match, but it looks like the engine was swapped out at some time. It was originally Luzon Red, but had been brush painted red, and then green there after. 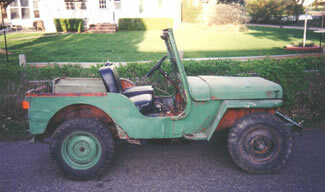 There was no wiring for lights, no turn signal switch, and very poor brakes. 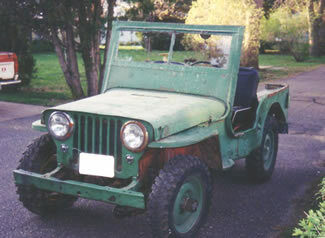 I purchased a switch and some front markers from Northstar Willys, and rewired it for turn signals and brake lights. It ran fine, but I Knew I had to do some major surgery before I'd be happy. It's currently in the process of a full frame-off restoration in my garage. I plan on trying to finish it by fall of 2006.